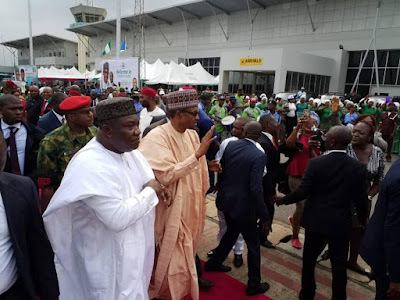 Enugu Youth Coalition has congratulated Governor Ifeanyi Ugwuanyi for welcoming and successfully hosting President Muhammadu Buhari while in the state for the continuation of his Presidential Campaign in Enugu. In a statement signed by the national coordinator of the coalition, Dr. Edwin Obune, the group commended the governor for showing the greatest level of political maturity and sagacity during and after the president's visit to the state. The group said, the governor's action has shown that Ifeanyi Ugwuanyi is not a governor for the PDP or the APC but the governor of all indigens and residents who lives and works in the state irrespective of party differences or affiliation. The group further noted that the governor's action is deeply rooted in the principles of the late Ibrahim Waziri's concept of politics without bitterness; a sterling quality needed to re-invent the dying spirit of "Ubuntu" among Nigerians and Africans at large. While urging other parties and governorship candidates in the state to emulate the leadership qualities of the governor by conducting their activities in the most ethical manner in the coming general elections, the group urged Ndi-Enugu to remain steadfast in their supports and prayers for the governor and his re-election bid come March 2nd this year. Enugu State Government under Gburugburu has shown that Nigerians of all tribes, creeds and political learnings can live together in a peaceful and united state where justice, equity, good governance and equality for all reigns supreme irrespective of our differences. We therefore hail the governor for turning our diversities in to our source of strength. Finally, Enugu State is in the hands of God and by the grace of God, the coming election will end in praise to glory of the awesome God we serve.